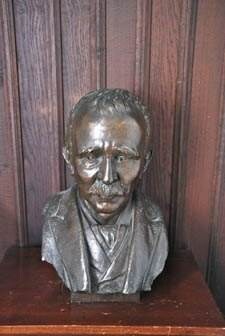 The bronze bust of one of Henley's most generous benefactors W J Fieldhouse, who revived the Court Leet in 1915 and paid for the restoration of the Guild Hall, has been stolen from its position outside the robing room on the first floor of the Guild Hall. 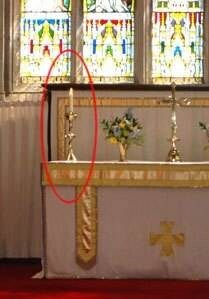 This theft comes shortly after the candlesticks (above right) were stolen from St John's Church which is next door. The High Bailiff has told Henley NEWS that the police have been advised and anyone who has seen anything suspicious should contact the incident room of Warwickshire Police or Crimestoppers. Suspicious characters have also been observed looking at the lead on the church roof. and the return of the bust of W J Fieldhouse to the Guild Hall. Danny King, Brum's 1st Popstar, was one of the celebrities who attended a press launch for the 60s Festival which takes place on the Henley Memorial Playing Fields on Saturday 17th September from 3 pm to 8 pm. 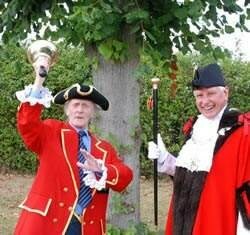 Danny became an assistant to the Town Crier for the day to summon all 60s Pop Fans to attend the event. 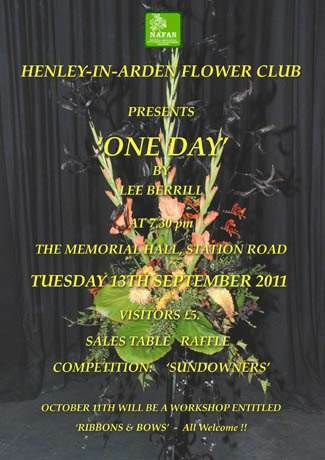 Danny told Henley NEWS, "It will be a great day. Great music, great atmosphere, so come along and join in with some of the legends of the Birmingham 60s rock scene. So dig in your wardrobes for those 60s outfits and get ready to join in the fun". 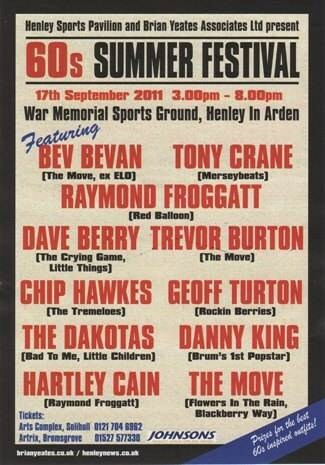 Peter Crathorne, Chairman of the Henley War Memorial Trust, says there will be a host of stars including: Bev Bevan, Tony Crane, Raymond Froggatt, Dave Berry and Danny King. Special discounted tickets for residents are available from Jan Crathorne or 01564 79595470. VIP Packages are available from the Bluebell and Matricardi's. 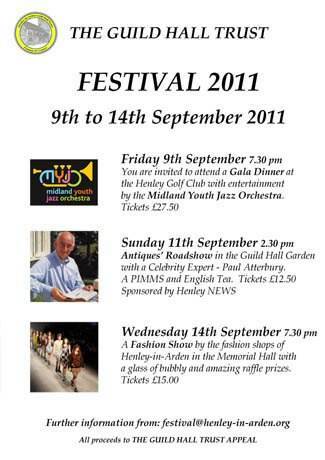 The Guild Hall Festival Antiques Road Show event will feature two international stars, Paul Atterbury and Rita Schindler. 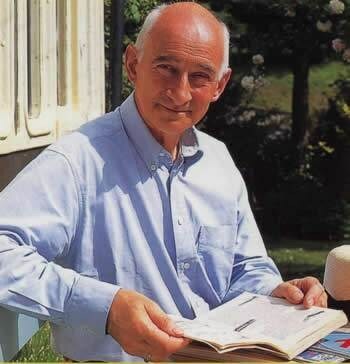 Paul Atterbury needs no introduction to viewers of the BBC Antiques Roadshow. He is the expert who wears the very flamboyant jackets. Paul specialises in the art, architecture, design and decorative arts of the nineteenth and twentieth centuries. 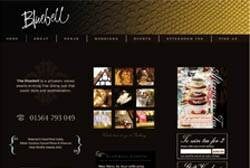 Trained initially as a graphic designer, he later studied art history and then worked for Sotheby Publications, as an historical advisor for Royal Doulton and then as editor of Connoisseur magazine. Since 1981 he has been a freelance writer, lecturer, broadcaster and exhibition curator, in this capacity usually for the Victoria and Albert Museum in London. Paul has written or edited over thirty books, mostly on ceramics, but he is also known for his travel writing and for books on railways and canals, and has recently published a couple of books on Eype and West Bay, both Dorset villages as seen through old postcards. 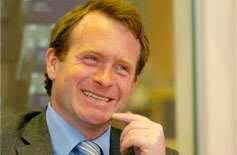 For the last fourteen years he has been a member of BBC TV's Antiques Roadshow team of experts, working usually in the miscellaneous section which gives him ample opportunity to explore the antiques and collectables of the nineteenth and twentieth centuries. During this time he has taken part in over a hundred Roadshows and has also appeared regularly on the Great Antiques Hunt, the Antiques Show and on Hidden Treasures on BBC Radio Four. Rita Schindler will be playing the Harp during the afternoon event. Rita was born in Budapest in 1987. She studied at the Zoltán Kodály Hungarian Choir School in Budapest. At 14 she began to learn to play the harp with Csilla Gulyás. In 2007 she began studies with Catherine White at Birmingham Conservatoire. She currently plays with different symphony orchestras and ensembles and has been a member of the City of Birmingham Symphony Orchestra's Youth Orchestra. 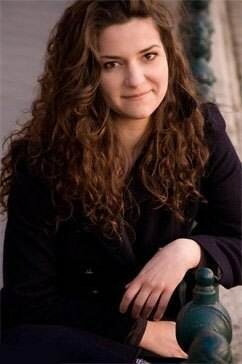 She was selected to be a member of the Royal Philharmonic Society's Young Artists in 2008 and was also a John Barbirolli Recipient. In 2010 she was First prize winner with distinction at the North London Festival of Music and Drama chamber music competition. Tickets for the Antiques Roadshow event are priced at only £12.50, including a traditional english tea, and can be obtained by clicking on the link below. Like most people in this country and indeed around the world I have been watching the riots around the UK with ever increasing concern and dismay. I offer no answer or explanation as to why, save to say that within Stratford District Council they have got their priorities in place. After all this week, my recycling bin was not emptied because I had foolishly left two shopping bags in amongst the bottles, plastic etc and what right minded refuse police officer would permit that offence to go unpunished. Indeed I have been told it will not be collected even though the bags have been removed. The offending bin must remain full on the street and await another inspection to see if it passes muster in two weeks time. Good to know that whilst the social fabric of our society is being torn to pieces, SDC at least have more important things to worry about. You have been warned fellow residents! After almost 2,000 residents across the Stratford-on-Avon district were caught off guard last week when their blue-lidded recycling bins were not emptied and were instead classed as ‘contaminated’, Stratford-on-Avon District Council announced yesterday that it was backing off and residents would be given a period of grace until the end of September. Eight per cent of residents were affected when the recycling rules were being enforced last week. The district council said that contamination was caused by non-recyclable items ending up in the the blue-lidded recycling bins. 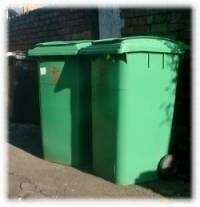 Tony Perks, acting head of the technical services at the district council, reassured residents that anyone who has not had their recycling collected can place additional recycling in an open-lidded box next to the recycling bin. Congratulations to Mike Faulkner and all those who objected. The Chairman of the Parish Council, Councillor Roger Hubbocks, and the High Bailiff John Rutherford, accompanied by the Town Crier Gordon Trinder, joined stars from the show to launch the event at the sports grounds on Wednesday 17th August. They agreed that now is the time to purchase your tickets for the most exiting event to happen in our area for a long time. Henley is hosting a 60s spectacular music show with sensational artists. The performers are a who’s who of Birmingham’s finest musicians. 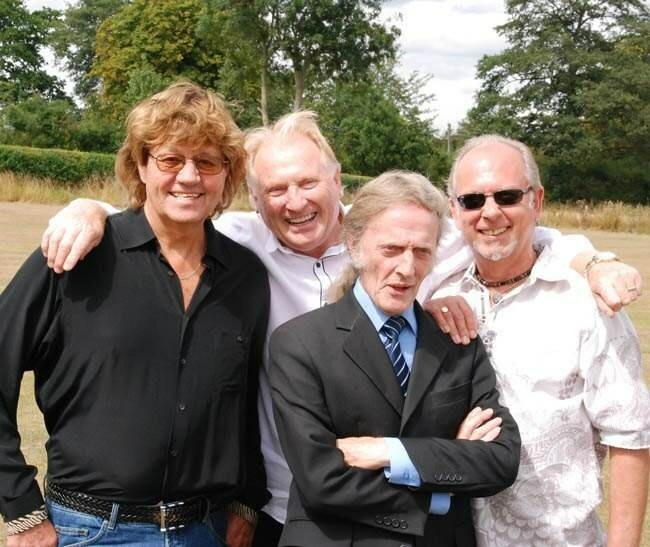 The performers include Bev Bevan from The Move and The Electric Light Orchestra, Trevor Burton who still plays for the Move (a group with ten chart hits to their credit: do you remember “I can hear the grass grow”, “Flowers in the Rain”? ); Tony Crane of the Merseybeats who released the million selling “I think of You”; Dave Berry who used to be with the Cruisers, “The Crying Game” in 1964. 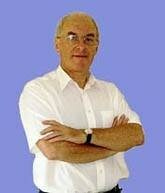 The Tremeloes are represented by Chip Hawkes, they had a number one with “Do you love me?”. Do you recall the Dakotas, the Rockin Berries, Raymond Froggatt, Hartley Cain and Danny King? This fabulous line up is on stage for five hours of magical music. With 100 million world wide sales and 100 chart hits between them this is a real chance to see and be proud Birmingham’s popular music heritage. 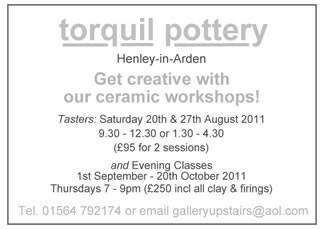 Here in Henley! 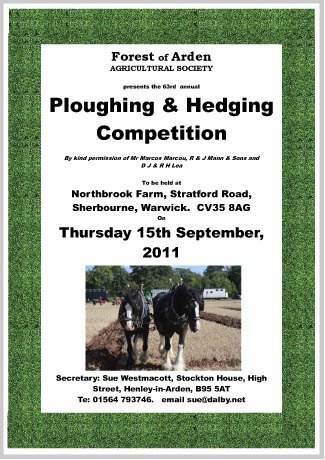 Locals email or telephone 01564 795470 for your tickets (£25). 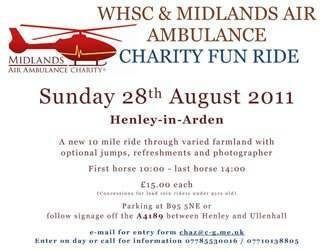 They are also on sale at Solihull Box Office 0121 704 6962 and ‘artrix.co.uk’ for internet sales. 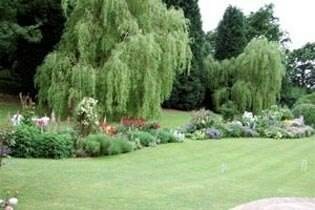 (£27.50) Bring your picnics, bring your picnic chairs, children are free of charge and enjoy a truly family party day with free parking. Tickets are being sold at over 100 per day, those allocated to local residents are running out. The very popular VIP package has places left see below for the details. On Monday 22nd August John Rutherford, High Bailiff assisted by Gordon Trinder, Town Crier and John Tristram, Low Bailiff, had the pleasurable duty of opening La Dolce Piazza. This family friendly establishment has been greatly missed by residents and judging by the numbers attending the opening ceremony, Maria-Rosa and Gamal will enjoy brisk trade. We congratulate them on reopening and wish them every success for the future. 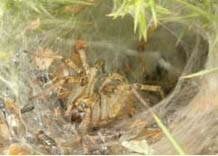 On Tuesday 26th July Henley in Arden Wildlife Society made its 3rd expedition of the summer. 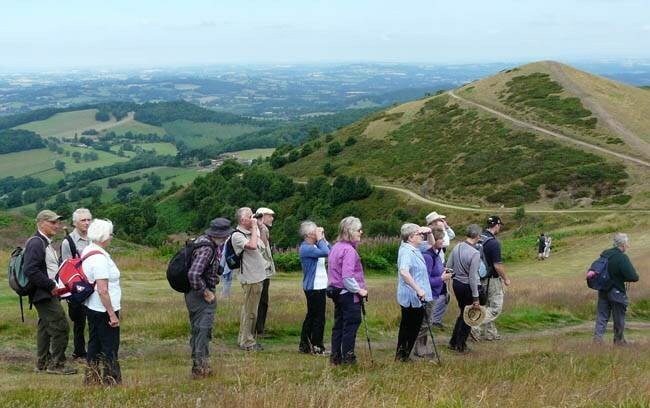 This time it was to the Malverns, where Ian Butler spent the day taking us around the hills, showing us all sorts of life that we would not have otherwise spotted. In the morning we strolled about 4 miles around Worcestershire Beacon looking at the rare grayling butterflies, buzzards hovering at head height, holes where field voles lived, wheatears and stonechats in the gorse, the colourful greater spotted woodpeckers in the trees, an amazing vapourer caterpillar and funnel web spiders in their funnel-shaped webs, to name but a few. 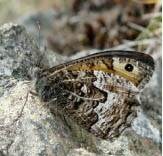 The weather was clear but not hot, ideal for both the wonderful views and the fact that the butterflies and moths like to bask in the sunshine. 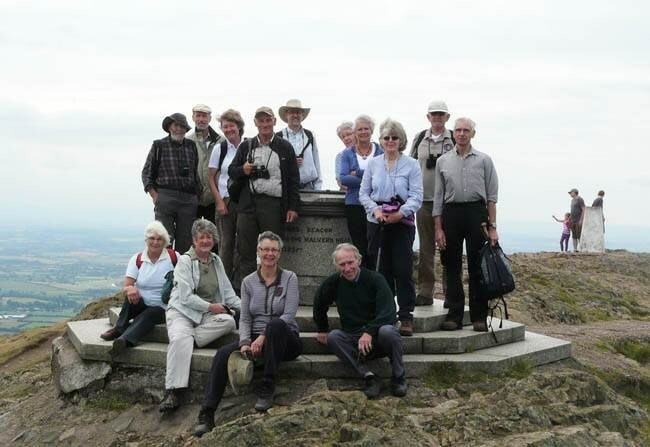 We all took picnic lunches and in the afternoon more members joined the 3 mile walk around the British Camp area. There we sat down watching a variety of birds: pied flycatchers, meadow pipits, green woodpeckers, linnets, redstarts and skylarks. There were too many to remember. Many members took binoculars with them and Ian passed around his rather superior pair from time to time. His knowledge of the habits of creatures, from the particular rocks where the graylings liked to perch to the marks where woodpeckers had fed at ant nests, made it a most enjoyable and informative day. None of us would have observed half as much without his guidance. The next Society meeting will be at the Baptist Hall on 20th September. The subject, “Hunting for British Orchids”. 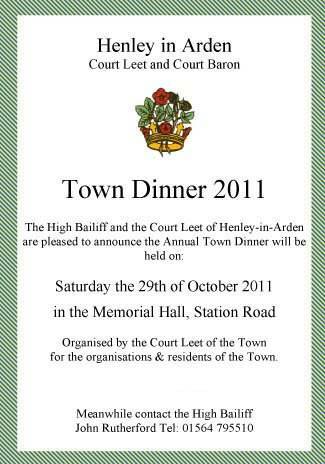 The Henley-in-Arden Drama Society (HADS) is holding its AGM in the Memorial hall (Station Road) on Monday evening, 5th September, at 8pm. Visitors are welcome, and will be greeted with a glass of wine upon arrival. If you have ever thought of treading the boards (or helping out in any other way), why not come down and enjoy a friendly evening? You will be made very welcome. 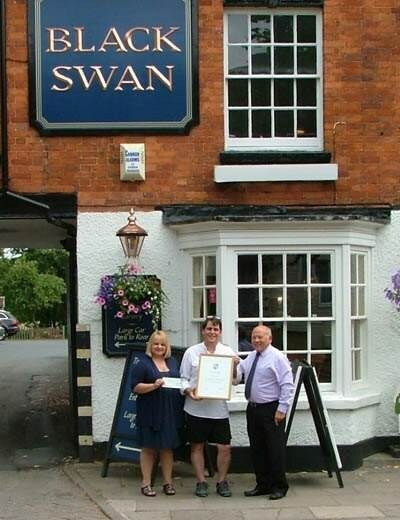 Linda and Ian Jackson at The Black Swan have triumphed again by winning the Best Cellar 2011 – South West Area award in the Innserve Best Cellar Awards. Best Cellar is an awards scheme from beer services company Innserve, which not only rewards best practice but focuses licensees on one of the key reasons for a successful pub: the quality of its beer. The Black Swan came out on top when they were judged on their cellar management based on their above and below the bar equipment, cellar equipment and health and safety awareness in the cellar. The Best Cellar awards are open to Innserve serviced cellars, within the 17 management areas across the country, where the licensee has been in their present outlet for approximately 12 months and has shown dramatic improvement in beer dispense quality and customer offering. 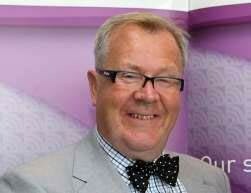 Licensees, Ian & Linda Jackson, comment: “We are delighted to receive such a prestigious award! We pride ourselves on maintaining our cellar to the highest standards to ensure the beer we serve is the best it can be. We’re honoured to receive this industry wide recognition from Innserve.” Ian, Linda and the team were awarded with a winner’s plaque and certificate highlighting their achievement together with a cheque for £200 and will now go through to the regional finals. The Black Swan is now offering a lightbites & takeaway menu starting on Monday 22nd August which will be available Monday - Saturday 12.00pm - 3.00pm. This will include a range of sandwiches, paninis and wraps, baked potatoes, pizzas and mini hot meals to eat in or take out. For orders over £10.00 we will offer free delivery on the High Street. You can buy your tickets to the 60s Festival from the bar of the Black Swan. After the 60s Festival has finished on Saturday 17th September, the Black Swan will be organising a 50s/60s/70s karaoke/disco with free entry from 9.00pm. Barcodes that you see on any commercial product are extremely beneficial as their reading speed, supreme accuracy and their functionality are key. As barcodes reached their peak and began getting used worldwide, the need for more data and character types to be stored was inevitable. Developers began trying to expand on the current amount of bars within the barcode and how their positioning resides to allow further data capacities. 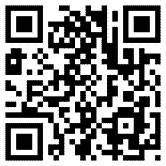 The need for smaller barcodes also was another defining factor in QR-Codes development. Such developments failed as reading and printing implications caused more problems than solutions. The 2D barcode was then born. 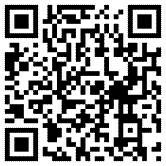 QR-Codes first hit mainstream when they were initially used for tracking parts by vehicle manufacturers. After a while, companies began to see a new scope for where QR-Codes could be used elsewhere within the world. The most commercial use for QR-Codes is in the telecommunications industry where the mobile phone seems to be the biggest driver of their popularity. With the technology of mobile phones constantly expanding, especially within mobile internet, QR-Codes seemed the perfect solution to quickly and efficiently bring mobile phone users onto the mobile web. 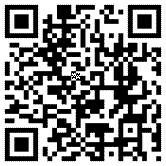 QR-Codes can be used to store all kinds of data including URLs (Universal Resource Locator) or as most people know them, web addresses. 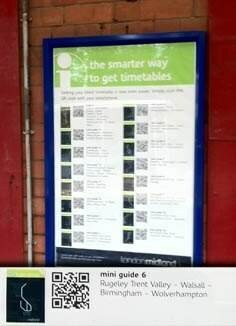 The picture right shows a new poster on Henley Station displaying the QR-Codes for timetables. The code for the timetable mini guide 6 at the bottom of the picture works. 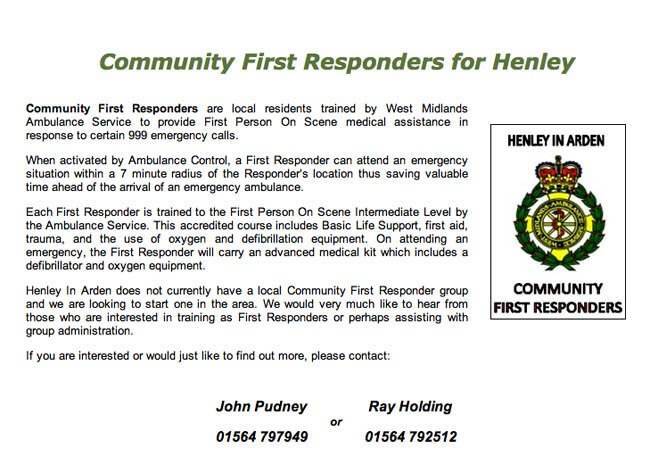 These are the QR Codes of some of the popular organisations in Henley. For the results see "QR Codes" below, just before the Notice Board. There are plenty of creative ideas for how businesses, non-profits and municipalities can use QR codes to market and communicate themselves better to their stakeholders. Here are 10 that I came up with or stumbled upon. QR Codes on bus stops, train stations and underground stations: A quick scan would give you realtime information on when the next bus or train will arrive. Posted next to paintings and sculptures at museums. Great for visitors who want to learn more about the artist, the time period, and the reaction to the photo. On historical sites and on walking trails so that visitors can delve deeper about the significance of the site. On house For Sale and To Let signs so that you can download the particulars. On shop windows so that when you get home you can go on-line. Next to food in supermarkets to give shoppers quick access to recipes that include the ingredients on the shelf. 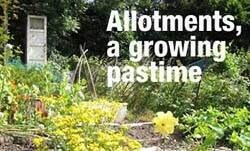 On grocies so you can see information about the farm, best by dates, prices, etc. On bottles of wine, so you can get info about the vineyard, and maybe buy a case of that bottle you enjoyed at a restaurant. At the bottom of newspaper and magazine articles so you could quickly get to the online version and see the comments that other readers had left. On building permits. New York City is already doing this. 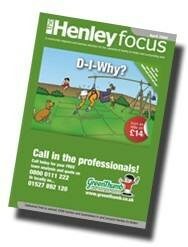 If you would like your QR Code in your shop window, Henley NEWS will print and deliver it for FREE. 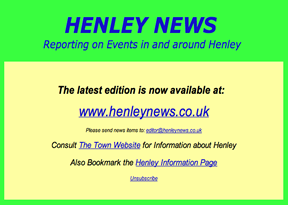 A reader has asked Henley NEWS to disseminate the information as widely and was quickly as we can through NEIGHBOURHOOD WATCH, School Safe and others. This one is pretty slick since they provide YOU with all the information, except the one piece they want. The scam works like this: Person calling says, "This is (name), and I'm calling from the Security and Fraud Department at VISA. My badge number is 12460. "Your card has been flagged for an unusual purchase pattern, and I'm calling to verify. This would be on your VISA card which was issued by (name of bank). Did you purchase an Anti-Telemarketing Device for £497.99 from a Marketing company based in London?" When you say "No", the caller continues with, "Then we will be issuing a credit to your account. This is a company we have been watching and the charges range from £297 to £497, just under the £500 purchase pattern that flags most cards. Before your next statement, the credit will be sent to (gives you your address), is that correct?" You say "yes". 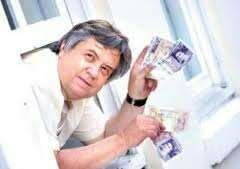 The caller continues - "I will be starting a fraud investigation". If you have any questions, you should call the 0800 number listed on the back of your card (0800-VISA) and ask for Security. You will need to refer to this Control Number. The caller then gives you a 6 digit number. "Do you need me to read it again?" Here's the IMPORTANT part on how the scam works the caller then says, "I need to verify you are in possession of your card." He'll ask you to "turn your card over and look for some numbers." There are 7 numbers; the first 4 are part of your card number, the next 3 are the security numbers that verify you are the possessor of the card. These are the numbers you sometimes use to make Internet purchases to prove you have the card. The caller will ask you to read the 3 numbers to him. After you tell the caller the 3 numbers, he'll say, "That is correct, I just needed to verify that the card has not been lost or stolen, and that you still have your card. Do you have any other questions?" After you say, "No," the caller then thanks you and states, "Don't hesitate to call back if you do", and hangs up. You actually say very little, and they never ask for or tell you the Card number . The REAL VISA Security Department told us it was a scam and in the last 15 minutes a new purchase of £497.99 was charged to our card. Long story - short - we made a real fraud report and closed the VISA account. VISA is reissuing us a new number. What the scammers want is the 3-digit PIN number on the back of the card. Don't give it to them. Instead, tell them you'll call VISA or MasterCard directly for verification of their conversation. 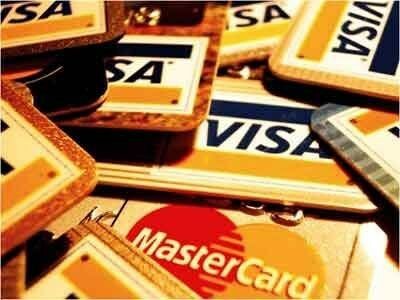 The real VISA told us that they will never ask for anything on the card as they already know the information since they issued the card! If you give the scammers your 3 Digit PIN Number you think you're receiving a credit. However, by the time you get your statement you'll see charges for purchases you didn't make, and by then it's almost too late and/or more difficult to actually file a fraud report. What makes this more remarkable is that on Thursday, I got a call from a "Jason Richardson of MasterCard" with a word-for-word repeat of the VISA scam. This time I didn't let him finish I hung up! We filed a police report, as instructed by VISA. The police said they are taking several of these reports daily! They also urged us to tell everybody we know that this scam is happening . Burglary dwellings have continued to fall, but whilst they remain low residents are reminded to remain vigilant at all times. Your Safer NEIGHBOURHOOD Team is continuing to provide an increased presence in the form of high visibility patrols in all areas to reduce burglary rates. One dwelling has been broken into in Wawensmere, Wootton Wawen where offenders have jemmied the patio doors and once within have taken the keys in order to steal a Range Rover and BMW. One dwelling has been broken into on Kington Lane, Claverdon where offender/s entered through an insecure window and stole a quantity of jewellery. "Burglary other" incidents have significantly reduced when compared with recent months and have reduce slightly when compared with last year. An insecure shed was broken into on the Stratford Road in Wootton Wawen and a Mountain bike valued at £350 was taken from within. Theft from Motor Vehicles as fallen when compare with last year but is comparable with last month and mainly centres around theft of number plates with incidents recorded in Warwick Road, and The Croft, Henley; Kington Lane and Church Lane, Claverdon. In order to reduce the quantity of number plates being stolen anti theft screws are available. 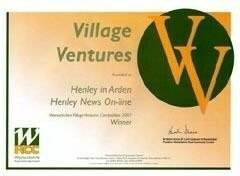 Burglaries in Henley in Arden, Wootton Wawen, Claverdon & Langley - 12 targeted high visibility patrols to be carried out to combat the burglary rate. Checks to be made regarding anybody acting suspiciously and person/s to be dealt with accordingly. 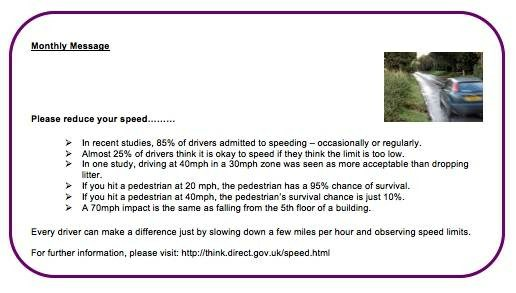 Speeding, A4189, Claverdon - 12 x targeted speed checks to be carried out with advice and/or enforcement where appropriate. Obstruction/Speeding, Mayswood Road, Wootton Wawen - Concerns raised regarding the junction of Mayswood Road/A3400 Wootton Wawen. Warwickshire County Council have agreed to look at the junction layout while the Safer NEIGHBOURHOOD Team will conduct 4 x targeted patrols regarding obstructions and 4 x speed checks on Mayswood Road. Following a break in at the scrap yard in Bearley earlier in the year the male offender attended court in July and was found guilty, he has been sentenced a to £100 fine, plus £310 costs. Three people have been banned from Henley Pub Watch for using an illegal substance on licensed premises. It has been agreed with Wootton Wawen Parish Council to reintroduce Police Surgeries in the village. These will be held monthly and at Wootton Hall where the Mobile Police Station will be parked up for local residents to ‘drop in’ and speak with local officers about local issues/problems. 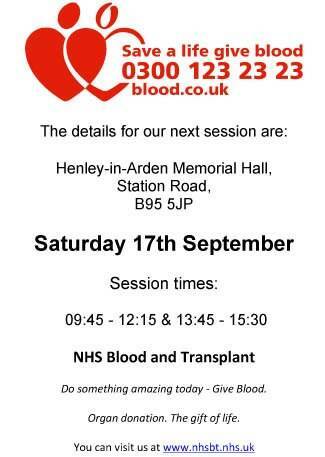 The first was planned for the 24th August between 2pm – 2.30pm. 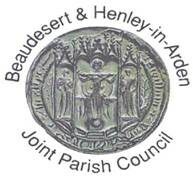 The next Community Forum will be held 6th October, 7pm, Henley High School, Henley in Arden. If you have a specific concern then come along to the local surgery, where you will be able to speak to your local Safer NEIGHBOURHOOD Policing Team, Warwickshire County Council or Stratford District Council Officer. 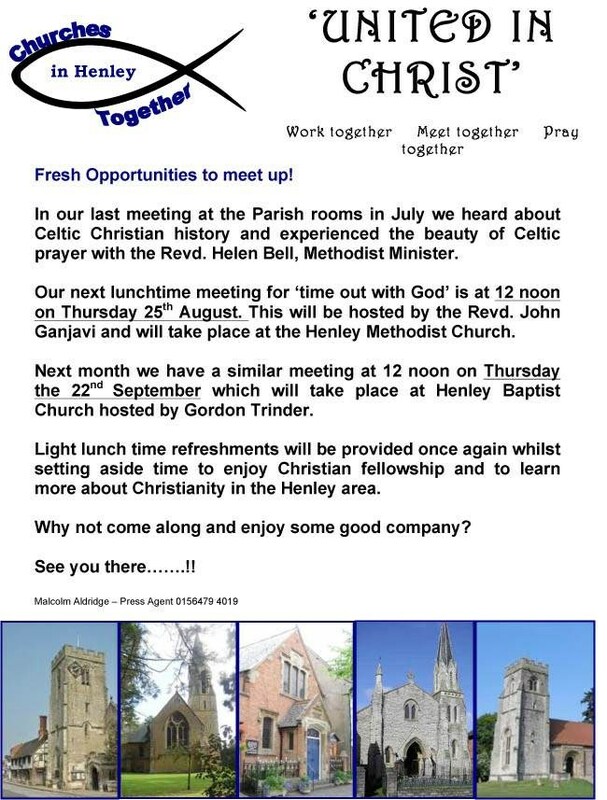 The next Henley Community Surgery will be held, 28th September, 11:30am, Henley Baptist Church Hall. The surgery gives you the opportunity to speak to members of the Parish Council & Safer NEIGHBOURHOOD Policing Team about the issues that concern you, while giving you feedback regarding what is happening in the community. The next Henley Police Surgery will be held 24th August & 19th October, between 11am – 11:30am, Mobile Police Station, Henley Medical Centre Car Park – A drop in facility to discuss issues/problems within the community with your local policing team. The next Claverdon NEIGHBOURHOOD WATCH Meeting will be held 27th September, 7:30pm, Dorothea Mitchell Hall. The next Claverdon Police Surgery will be held 27th September, between 7pm – 7:30pm, Dorothea Mitchell Hall - a drop in facility to discuss issues/problems within the community with your local policing team. I would like to thank Tony Capps for the reference to numerous articles on the subject of environmental impact of e-books. Perhaps any of you thinking of an e-reader will just spend a little time looking at this website; look at the issues and weigh up the number of books you read in a year before you decide buy. The subject is complex, but having reviewed the articles myself, I think there is a general consensus that you need to read a lot of e-books to reach a break even point in Carbon pollution. What is meant by a lot varies. Figures of 18, 23, 26, 32, 40 and 100 can be found in the articles, so somewhere in the middle of this range would be a reasonable figure to work with until we have more certain estimates. My original article said about 50 books and that another estimate put it at 100, so the information from the website does not change the position materially. My article did not say that electronic books should not be used, but warned that if you got an e-reader and only read a few books with it, there would be more carbon pollution than if you had just bought the books. The key question is how many books will be read on an e-reader before the relentless effects of marketing and peer pressure lead to the purchase of a new one. Is it likely that people will still be using the same e-reader in 5 years time? I think not, because by then a newer and shinier one with more ‘must have’ bells and whistles will be irresistible. Unless at least 20 books and more likely 40 or 50 (that’s about 10 books per year) have been read on the old one, it will not have repaid its carbon debt. So as I said before, beware the gizmo and if you give ordinary books away when you have read them, the break even point of the e-reader becomes more like 80 books and if the people you give them to also pass the books on, it’s 120. So, unless you read a lot, paper books will produce less carbon pollution, especially if you share them with others as Judith Lindley suggests in her letter. Hear presentations on the Government's flagship 'Green Deal' policy to see the energy performance of UK's housing / non-domestic buildings vastly improved. The Energy Bill, introduced to Parliament in December 2010, includes provision for the new 'Green Deal', which is intended to revolutionise the energy efficiency of British properties. The Government is establishing a framework to enable private firms to offer consumers energy efficiency improvements to their homes, community spaces and businesses at no upfront cost, and to recoup payments through a charge in instalments on the energy bill. Tim is well known for his passion in tackling climate change and energy security issues through the building supply industry. 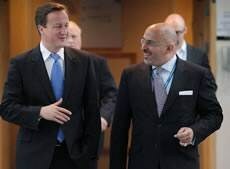 He is closely involved in work streams to deliver the Green Deal - and in particular trying to ensure that local and smaller builders get a share of huge business opportunities that will come. Presentations will be followed by questions and a discussion facilitated by Roger Matthews - Community Energy Warwickshire. Research conducted last month has shown that the abundance of Blackberries, iPhones and similar gadgets intended to make employees more productive is leading to poor etiquette both in the office and at home. During face-to-face meetings, 41% of UK workers remain glued to their communication devices, sending instant messages, responding to texts, listening to voicemails or checking their emails. 31% even admit to disrupting face-to-face meetings to answer their mobile phones (paradoxically 40% of these individuals agree it is rude to do so). Age plays a major part in workplace etiquette: one in three workers aged 20-39 will take a mobile phone call while in a meeting, compared with 20% of people aged 40-60 and just 10% of people over the age of 60. It would seem we have a classic case of double standards in the workplace, with 82% complaining about other people’s tendencies to disrupt proceedings by answering a mobile phone, tweeting, sending an instant message, responding to emails or even just updating their social status. Yet, rather ironically, 70% of those that rudely interrupt meetings themselves would be offended if someone did the same thing to them. Clearly, the perceived pressure to stay connected has led many people to neglect their manners. 85% keep connected during weekends. 79% stay tuned in during evenings. 74% keep in touch with the office while on holiday. 48% even stay online while in bed. 35% report they never disconnect from the office. So what's driving this addiction? A third of survey respondents said they fear they will lose their competitive edge if they disconnect from their inbox for 30 minutes or less, and 20% felt in danger of losing the upper hand over their careers when cut off from email for just five minutes. Yet all this connectivity doesn't generate greater productivity, as a third of employees are interrupted at least every 15 minutes. After each distraction, it can take another 20 minutes to regain focus and return to the task at hand. employees return to work from the weekend or holiday with less energy and inspiration than they otherwise would. I am not one of those people. Of course not! With rising energy costs, roof top solar energy installations are becoming increasingly popular projects with many new companies entering the market offering free solar panels and free or reduced cost electricity. However, Trading Standards Officers have received complaints from consumers who have paid large deposits of £250 for the installation of solar panels to their properties following door to door visits. In these cases, the panels were not fitted and the trader disappeared. Traders that offer free solar panels and free electricity can do so because they will receive income from the generation of electricity (the Feed-in tariff scheme) and from any electricity that you do not use and is exported to the grid. It may be more cost effective for you to buy your own solar panels and receive all the income yourself. If a trader is only offering discounted electricity, as opposed to free electricity, the Energy Saving Trust advise that your savings will be less and you may want to consider if it is really worth going ahead. The amount of money you could save will depend upon when you use electricity. You will save if you run your appliances during the day when it is 'sunny' and you are generating electricity and can benefit from it. Residents should also consider what would happen to the solar panels in the event of a house move and who is responsible for their maintenance and insurance. Voter registration forms will soon be dropping through letterboxes across Stratford-on-Avon District and residents are being urged to return them as soon as possible to make sure their voice is heard in next year’s elections. Stratford-on-Avon District Council’s Elections team will be sending forms to around 54,000 households in the District over the coming months to compile the electoral register. Darren Whitney, Stratford District Council’s Democratic Services Manager said: “Registering to vote is very simple and should only take a few minutes to complete. All you have to do is update the annual canvass form with the details of everyone in your household who is eligible to vote and return it to us as soon as possible. If your details haven’t changed you can also reply by phone or by internet. On the electoral registration form residents can opt to have their details excluded from the edited register. If you wish to opt out, even if you have done so in the past, you must tick the box in the relevant column or follow the instructions on the phone or internet. 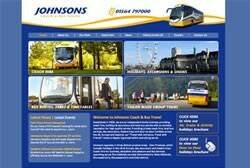 This will mean that details cannot be bought by individuals and commercial organisations. 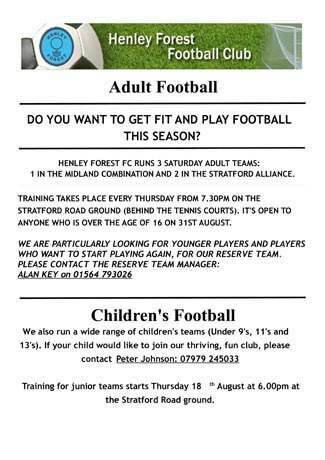 For further information or if you haven’t received your form after 5 September please contact the District Council on 01789 260208. 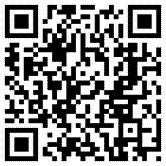 There are 2 free apps for the iPhone - QR app and QRReader. Both work well, probably QRReader is the better of the two. Android phones have their equivalents. 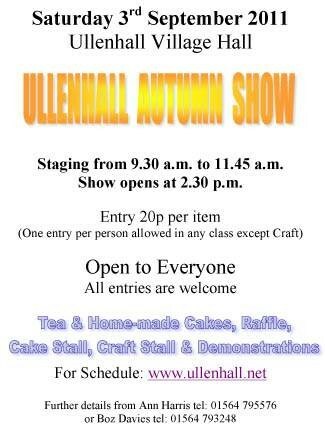 Wednesday 14th September A Fashion Show with a glass of bubbly in the Memorial Hall will be the final event. 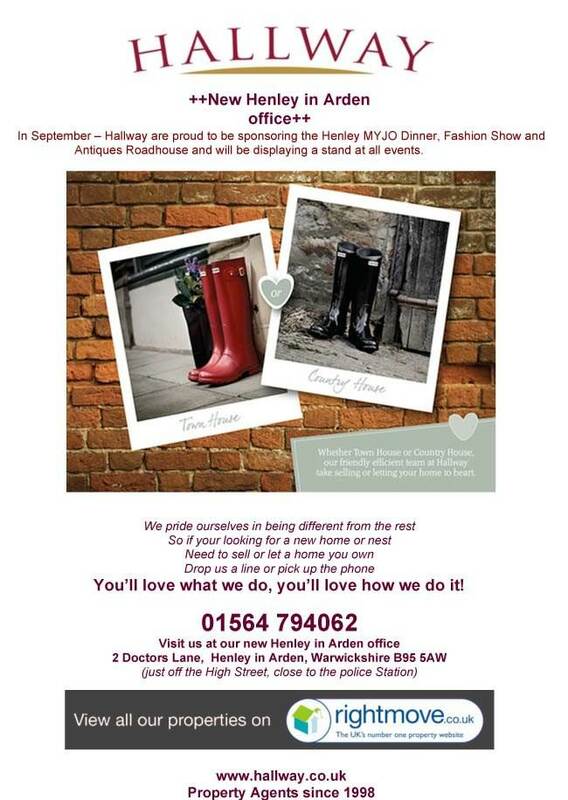 A promotion by the fashion shops of Henley-in-Arden. Doors will open at 7 pm and the show will start at 7:30 pm. 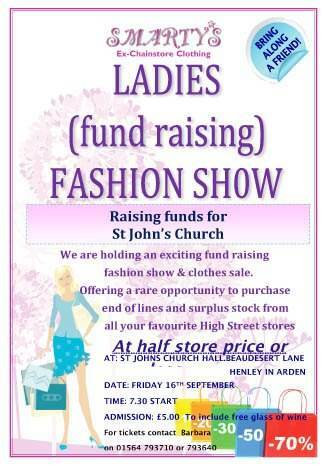 Friday 16th September St John’s Church Hall, Beaudesert Lane, Henley in Arden at 7.30pm in aid of church funds. Ladies – come along and enjoy this fashion show featuring ex chainstore clothing (sizes 8-22) from leading High Street stores. There is the opportunity to buy from a large selection afterwards at greatly reduced prices. Many items to be sold at half store price or less! 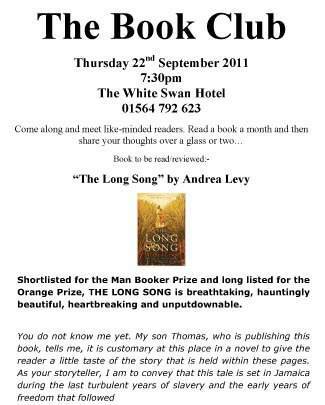 Tickets only £5 – to include a glass of wine. 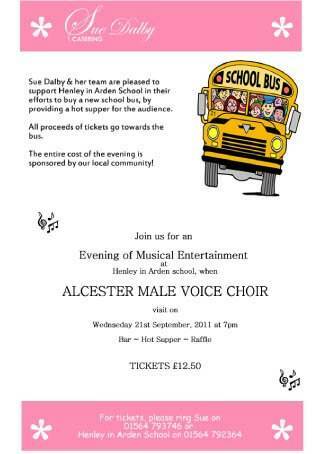 Tickets from Barbara Colclough 793710 or Daphne Jones 01926 843515. Tuesday 6th September Memorial Hall 7.30pm. Mary Moore will be asking “How well do you know Birmingham?”. Visitors welcome. Patchwork & Unfinished Objects Group Baptist Church Hall Wed Sept 14th 2 – 4pm. Contact 792488.